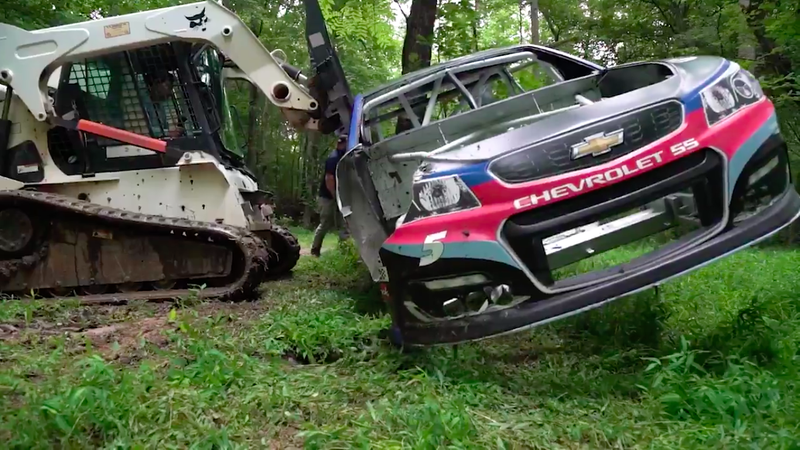 Here is the unique procedure that Dale Earnhardt Jr. does to some of the wrecks that enter his private property in North Carolina. Dubbed Dirty Mo Acres, this piece of rural property, totally surrounded by thick trees and foliage, is not only an area of respite for the two-time Daytona 500 winner, but it’s a resting place for Earnhardt’s hand-picked race-car wreckage. The latest addition seems to be Danica Patrick’s No. 10 Wonder Woman car from when she wrecked during at the Go Bowling 500 earlier in May. The process itself seems simple enough. A car is brought in on a flat-bed dually loaded up with a forklift at the shop. It’s then transported to Dirty Mo Acres, then the bed is tipped, and a bit of throttle input lets gravity do the rest. The wrecked car rolls off the back and into its new resting place. In the video, truck driver Sunny Lunsford explains a bit of the history behind this most ritualistic practice that started back in 2005. From the looks of things, most of the cars are placed just a few feet from the trail it’s driven on with no real rhyme or reason on where it ends up. There were no plans mentioned on what happens to cars after they’re placed at Dirty Mo Acres, but it looks like nature takes its course and adds its own personal patina. Circle of life, and all that. It would be awesome if one day this particular section of property was opened up to the respectful public to wander around. I can think of worse ways to spend an afternoon.